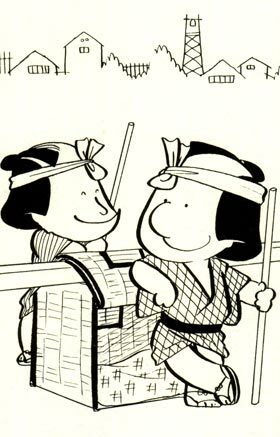 "Gonza to sukejû" was premiered in July 1926 at the Kabukiza [casting]. This drama was written by Okamoto Kidô, whose other masterpieces include "Shuzenji Monogatari" and "Banchô Sarayashiki", and was first staged at the Misonoza in July 1949. Today's performance is part of a famous Ôoka Seidan; the cases of Chief Justice Ôoka Echizen-no-Kami Tadasuke (1677~1751), former governor of Echizen, who lived during the Edo period. Even today, he is revered as a distinguished judge. This play relates the story of one of those cases. Today's version includes the same material as the Ôoka Seidan, but the flavor of the drama has been changed completely through its translation into Kabuki. With a comical and humorous theme, this play adapts a broad view of one of the stories, featuring plebian life as seen through the eyes of Gonza and Sukejû, the main characters. In the opening scene, the residents of a tenement house tackle the annual chore of cleaning their well. People during the Edo period would clean the local wells each summer as one of their seasonal chores. Thus, this scene is full of the season's atmosphere and highlights the comical, playful banter between Gonza, Sukejû, Gonza's wife, and Sukejû's brother--until Hikosaburô appears. Then the entire mood changes drastically, transforming the performance from a comedy to a detective drama. As is usual in the Ôoka Seidan, an unexpected fact is revealed as part of the grand finale. The play "Gonza to sukejû" is divided into two acts. In downtown Edo, many people, including beggar priests and monkey showmen, are present at a well cleaning festival. Everyone is working hard to clean the well. Among them is Sukejû's brother Sukehachi. Sukejû, a partner with Gonza as palanquin bearers, enters. He approaches Gonza's wife, Okan, and inquires about Gonza's whereabouts. Okan replies that he is napping. Feeling that Gonza should join in the well cleaning, Sukejû is displeased. Sukehachi agrees with his brother, so the two of them berate Okan. In the meantime, Gonza has awoken and appears. No sooner does he do so than Sukejû criticizes him and demands that he participate in the chore at hand. Gonza, however, ignores the order. He points out that his wife is helping and insists that that should be enough. Gonza and Sukejû argue with each other, but eventually Sukejû gives up and leaves the scene. After a little while, Sukejû and Sukehachi begin a brotherly quarrel, because Sukejû teases his him about being made a fool of by a monkey. The tenement residents rush in to stop their fight. Then their landlord, Rokurobê, comes over and reprimands them for their childish behavior. He orders everyone to hurry up with the job of cleaning the well and personally asks Gonza why he isn't working. To excuse his absence, Gonza claims he had a very important job which prevented him from arriving earlier. Hearing this, Sukejû expresses his sympathy for Gonza to Rokurobê, who, unmoved by his words, barks at Gonza and his wife, forcing him to join the others on the job at hand. Just then, Hikosaburô, the young owner of a fancy store, emerges. He is the son of Hikobei, who until recently lived in the tenement house and also owned a fancy store. Hikosaburô says he has received a letter, which states that his father robbed a retired woman of 100 ryô at an inn and murdered her. The letter states further that Hikobei was eventually arrested, but then died in jail. Seeing Hikosaburô's fierce determination, Gonza and Sukejû reluctantly confess their secret to Rokurobê. On the night that the woman was killed, the two of them saw Kantarô, a plasterer living near the tenement, washing what appeared to be a woman's sleeve and a glittering object, perhaps a sword, in a nearby rain barrel. Not wanting to be involved in such a serious matter, Gonza and Sukejû had until now kept that fact to themselves. Upon hearing their account, Rokurobê decides to deliver Hikosaburô, Gonza, and Sukejû to the police, with the intention of resolving the case. With this new information, Kantarô is also summoned by the police for questioning. Thus all four end up being examined by the court. A month later, having been released from custody, Gonza and Sukejû return home to their usual life, quarreling with each other, as is their usual practice. They soon hear from Sukehachi that the court has also released Kantarô. In a state of confusion they begin to doubt their previous testimony, thinking the person they saw might not have been Kantarô after all, a fact they had admitted to the court. Bearing fish and a barrel of sake, Kantarô comes to thank people at the tenement house, believing their testimony helped him obtain his release from custody. Despite his seemingly humble manner, Gonza and Sukejû find Kantarô's passivity a little strange. Then one of the showman's monkeys, which had been eyeing Kantarô, jumps at him. Kantarô's countenance drastically changes as he stabs the monkey, killing it. Then, just as quickly, he retreats behind a soft and calm facade and apologizes for killing the monkey. Acting as if nothing unusual had happened, he continues to expresses his thanks the tenants, saying to himself, but in a voice loud enough to be heard, "This might have happened because of my arrogant attitude and suspicious behavior. My summons to court was only natural because of my reputation as a dangerous fellow". Sukehachi cannot stomach Kantarô's transparent facade and the obvious resentment that he holds for everyone in his heart. Thus he openly expresses his rage against him. Gonza and Sukejû quite agree with Sukehachi's estimation of the situation and return the barrel of sake. In response, Kantarô turns violent and begins fighting with Sukehachi. The other people present, however, manage to pin him down and tie him up. Someone announces that the police have come, so Gonza and Sukejû hastily shut Kantarô in their palanquin to hide him. One of the police officers arrives and inquires as to Kantarô's whereabouts. People in the tenement house reply only with feigned ignorance. Just then, a struggling Kantarô bursts forth from the palanquin, crying for help. Instead of helping him, however, the police declare that proof of Kantarô's crime has come to light, arrest him once again, and take him away. Rokurobê and Hikosaburô arrive in time to see the stunned reaction of the residents of the tenement house from witnessing Kantarô's sudden arrest. Rokurobê informs people there was no proof at all of Kantarô's involvement in the old woman's murder. Therefore, after long and careful consideration, Magistrate Ôoka Echizen-no-Kami Tadasuke, allowed Kantarô to go in order to uncover the necessary evidence of his guilt. The magistrate's idea worked well. One of his men tailed Kantarô and witnessed him burning a cloth purse stained with blood, thus revealing his guilt. From the beginning of the case Magistrate Ôoka had his eye on Kantarô, thinking that he must be the true criminal. In fact, the magistrate was responsible for starting the rumor that Hikobei died in jail in order to encourage the true culprit to relax his guard. When Hikobei makes his appearance, Gonza, Sukejû, and the other residents rejoice over his acquittal. And so, the residents resume their peaceful lives of bickering and petty quarrelling.